“Spotting” in dance is a method of maintaining orientation when doing turns. It’s accomplished by maintaining focus on one spot in front of you, and then snapping your head around to that spot to complete the turn. 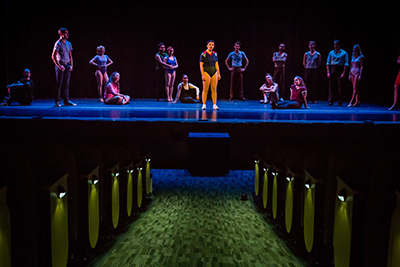 Metaphorically, a dancer’s life focuses on goals as they make many career turns and head snaps, and “A Chorus Line” reviews that life with its many turns and head snaps. But A Chorus Line does way more than talk about the aspirations and limitations of a dancer’s life. It is not only dancers that have dreams of success and being something special. 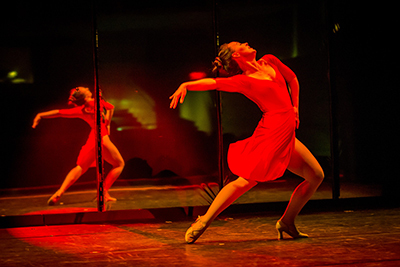 In this particular instance, the show focuses on the life of a Broadway dancer and the dedicated laser-like focus and devotion that they possess in attaining their dream. Dreams are dreams, whether they are an artistic dream or the American Dream. Dancers, performers, actually all people, hope to be something special, and often we are as unidentifiable as the next person — just background for a star and a part of the chorus line. The universal truths that this play addresses were the reason that it won the Pulitzer Prize in 1976. 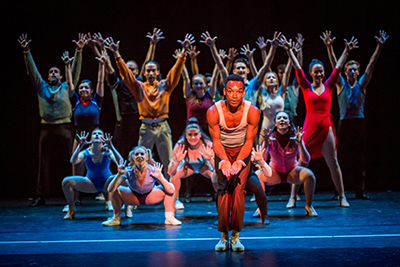 Now, the “spot” to go to see an exceptional production of “A Chorus Line” is at the Bucks County Center for the Performing Arts at the theater on the campus of Delaware Valley University in Doylestown. Howard Perloff is the founder and the artistic director of the group whose mission statement is “to develop a permanent, professional theater in Doylestown, Bucks County and provide quality productions and entertainment for public enjoyment.” With this show, more than ever, he is living up to that promise. 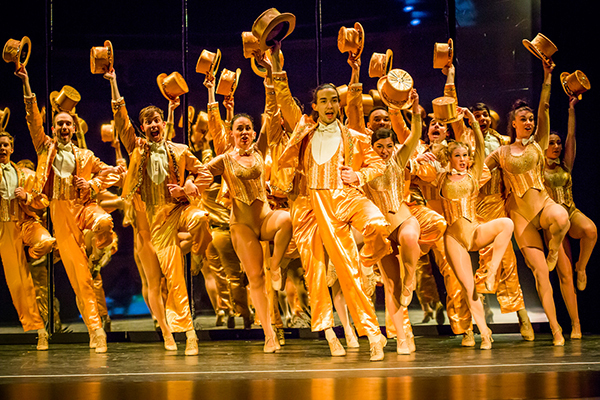 “A Chorus Line” was the most successful work shopped show in musical theater history. Usually, the source material is adapted from a book or movie or it is an original script that has been brought to a producer. This show came from a concept. It evolved from a workshop that began in January 1974 at the Nickolaus Exercise Center where the intent was not to do a Broadway show but to start a dance troupe. It was a taped session and, at subsequent meeting/tapings, Michael Bennett, the Broadway choreographer, was invited. He took over the group. The focus changed to putting on a show. The interviews and stories evolved into the book that was authored by James Kirkwood Jr. and Nicholas Dante. What is exceptional about this particular production is the honesty of the leads Cassie and Zach. It is true that, more than any other show, this is an ensemble. Each of the 17 finalists at the audition has a moment to shine, but the pivotal moment of the play is when the director, Zach, confronts his ex-girlfriend Cassie who, after doing featured roles in shows, wants to go back to the chorus. This story element mirrors the relationship between Michael Bennett and Donna McKechnie. Though it seems obvious that Cassie was McKechnie, McKechnie states that the character Maggie was more of who she was. It is true that the characters are composites of the different stories given from the interviews, but the similarities in the relationship between Zach and Cassie, and Bennett & McKechnie, are obvious. In the late 1970s, I lived in the building on 55th Street in New York where Michael Bennett and Donna McKechnie had lived. Though they had left the building, their names were still on the door ringer and mailbox in the lobby. They married Dec. 4, 1976, and separated a few months later. Their relationship was fascinating then and now. She was a girl from Michigan who came to New York, and Bennett was her Svengali. He gave McKechnie her best roles and made her famous. He wanted her to break out and go to the next level, but it never quite happened, and that is the story of Zach and Cassie. In real life, there also was the issue that besides being work obsessed, which was an issue for them, Bennett was bisexual. In most productions, the story gets told well enough, but the lead characters of Zach and Cassie seem flat, in comparison to the rest of the cast. In this production, Emily Larger seems to really get the role. I have not seen a performance of this role that is truer to Cassie’s reality. The determination that McKechnie, Cassie and Larger all have to do the work at hand, regardless of any other issue, is what the show is about. The written page, the role and actress seem to be meeting onstage and, in my opinion, Larger is giving a uniquely great performance. I believe Larger, like McKechnie, is from the Midwest. At least that is what I pick up from her dialect. Somehow, not just because it parallels McKecnnie, that seems right for the role and helps to see Cassie and Zach from two different worlds, not just in outlook, but in background. Achilles Iverson as Zach is equally strong. I have seen productions where the acting of these roles are not emotionally invested and the story still gets told only well enough. But these actors’ honest work in these roles make them resonate and this takes the production to the next level. Iverson reminds me of how I would think Bennett was and we usually never think about that. Often, this seems a show about a director who is some “any guy.” Iverson’s choices are exactly right, and make Zach the complex character that he is and Bennett was. A Chorus Line has never been better served in regards to these two exceptionally honest performances. As noted before, this is an ensemble show and this ensemble is incredible and truly a singular sensation. Meredith Beck as Sheila is impressive. She previously played Eliza Doolittle in “My Fair Lady” for this company. To say she is a good actress is an understatement. She plays the acerbic Sheila just right. She is the one who has seen it all and is living in her thirties in a dancer’s world where age is your enemy. The most moving moment of the show has always been the monologue by Paul, a Puerto Rican gay man. He reveals his life as a dancer in a seamy club, and how his mother and father dealt with who he was and is. J. Nicolas Gonzalez’s emotional nakedness as Paul doesn’t leave a dry eye in the house. A special mention for the lovely song “At the Ballet.” The voice and harmonies were pitch perfect. It is a precise song with choreographed movement and three emotional stories told by acting, song and dance. That all came together due to the talented triple-threat actresses, Meredith Beck (Sheila), Dani Cohen (Bebe) and Kathryn Miller (Maggie). All the dancers in this particular A Chorus Line are exceptional and come through with flying colors in telling their character’s stories. As an interesting aside, when the show was being workshopped in its early days, every night the eight hired for the show would be different. The actors themselves were surprised at who got the job. It was based on who had done the best that night, as if it were a real audition. That was changed for a couple of reasons, but with the amazing cast at the Bucks County Center for the Performing Arts, it would be tremendously difficult choice if that was still occurring. It would constantly change, as the depth of talent is so great on that stage. It would be anybody’s guess as to who would get the job. Tickets for A Chorus Line are available online or by calling (215) 297-8540. The show runs through Aug. 19.